Walking is a great form of transportation. Buses compliment walking. Or maybe walking compliments buses. Here's how we got from our host home to the venue to watch the Cross Country Ski Race this morning. TOTAL TIME = 135 minutes (2 hours, 15 minutes) from the time we left our house until we arrived at the Cross Country Ski Complex. It's not easy getting around during the Olympics. But that's part of the fun - big crowds, switching buses, lots of walking, talking to people on the bus rides, etc. And just to give a comparison: on a normal day in Whistler you could drive from our host home to the Cross Country Ski Complex in less than 30 minutes. There is a funny part of our adventure today. The Lot #5 is only a 5-minute walk from our host home. Had we realized at the start of the day that we were going to that Lot, we could have eliminated 85 minutes of walking and riding! Next time we will consult the bus route map! The cross country ski race was exciting. Great enthusiasm from the fans, everyone getting along wonderfully, kids sliding down hills of snow (not even realizing the Olympics were going on). It was the Ladies 15k race and then the Men's. Two of our chaplains have competed at the highest level (World Cup for one of them, Olympics for the other) so they really appreciated getting to see the race in person. I was just thinking about how tired I was from 135 minutes of bus riding and walking! A guy they call "Q," the youth pastor of Bethany Baptist Church (McDonough, GA) was able to join us. We all had a great time. Maybe you saw us on TV? We were at the 7k mark of the race. After the race, we went back to work inside the Village. We had a great time chatting with the chaplains from the other faiths that we are sharing worship space with in the Multi-Faith Centre, and then chatting with the gentleman who will be the head chaplain for the 2012 Summer Olympics in London. I met some college students from the University of South Carolina (go SEC!) who are at the Olympics as part of an internship. Throughout the afternoon and evening, many people came in to sign the book of condolences that will be sent to Nodar's family. Late in the evening, two athletes came by just checking out the Multi-Faith Centre. They said they'd like to come back another time to join us for Bible study. During the early evening, one of the other chaplains (Steve) and I spent some time in prayer, asking God to move in powerful ways in the hearts and lives of athletes, meeting their needs, drawing them to Himself, helping them to do their best, protecting them, and letting the Christian athletes' faith in Christ shine brightly. Bible study tonight was on Galatians 6:2, about helping to carry each other's burdens. We ended by praying for Sara as she gets ready for her biathlon race tomorrow. I caught up with the mission team from GA at the host home tonight. When I asked them, "How was your day?" the first thing they said was,"We walked forever!" Sounds like every day at the Olympics! 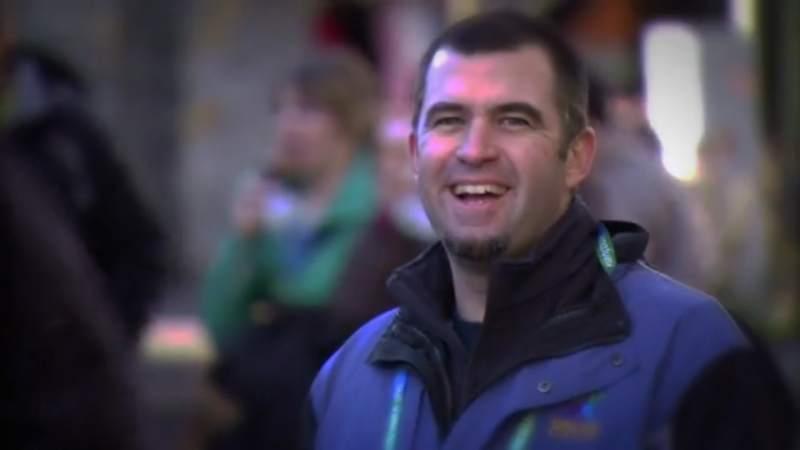 I was driving to work this morning, listening to KLOVE on the radio and in their news report I heard about how Pastor Derek Spain is serving at the Olympics. What a blessing for KLOVE listeners(and NCM Blog readers) to hear of how God is at work at in Vancouver! Praying for the athletes, for their safety, that the Lord will draw them to Himself, and that He will use this ministry in a mighty way for His glory.